Mabuhay! Welcome to the Philippines!!! Yes, the 65th annual Miss Universe pageant is officially on the roll as 86 of the most beautiful women from all parts of the globe have already landed at the home of the reigning Miss Universe, Pia Wurtzbach. The Philippines is playing host to this spectacular event for the third time – the last time it hosted was in 1994 – yet the chilly breeze of January could not stop the heat from spreading across the archipelago as the delegates were divided into groups, and are now traveling to few touristic locations in the country. As of press time, a group of delegates have already been brought to the island of Boracay, and also into the UNESCO heritage town of Vigan, in Ilocos Sur. The remaining delegates are on stand by at the posh Conrad Hotel in Manila for photo shooting. Unsurprisingly, Andrea Tovar of Colombia is No.1 on the list. 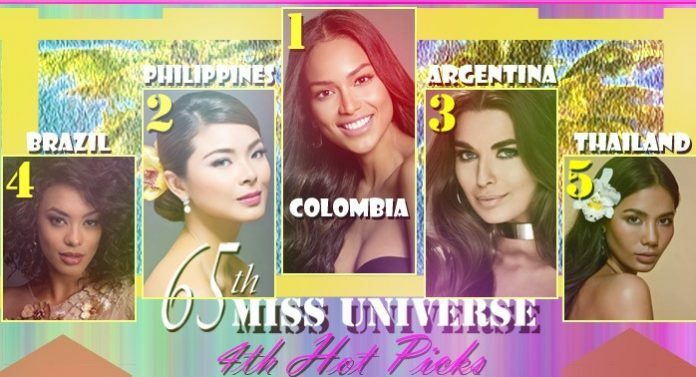 This is the first time that the beautiful señorita is leading our hot picks, which is a bit ironic because Andrea is actually one of the first delegates to be elected to compete at Miss Universe this year. In fact she was already a crowned queen before the controversial crown-switching happened between her predecessor Ariadna Gutierrez and Pia Wurtzbach in Las Vegas on December 2015. Needless to say, this gorgeous mulatta has been the talk of the forum even before she landed in the Philippines. The pressure is also on her shoulders as she meet the expectations of her compatriots who are still hurting from last year’s fiasco. Interestingly, Andrea is the first black delegate since 2001 to represent Colombia, which is considered to be symbolic because most of the black minorities in her country belong to the marginalized sector of society. But Andrea is from a well-to-do family, being a daughter of a father physician and a mother who is a businesswoman. Hopes are high for Andrea, but will the crown go back to Colombia? In second place, and down by one position since our previous hot picks, is Maxine Medina of the Philippines. Although Maxine is honest about her weakness – which is her public speaking skills – it cannot be denied that this professional model is too stunning to be ignored. Thanks to her Binibining Pilipinas training, she was groomed to perfection before arriving at the official hotel Being the flag bearer of the host country, obviously, is an advantage for Maxine as she will naturally get the support of the home crowd wherever she goes. Pageantry is being taken seriously in this tropical country, so we can only expect Maxine to improve further and gain more confidence, especially in the question and answer round. Won’t it be interesting to see both Colombia and the Philippines, once again, as the last two standing during the final night? However, there are serious threats too! Meet our No.3 in the hot picks, Estefania Bernal of Argentina. Totally overlooked prior to the arrival of the candidates, Estefania emerged as a new favorite as she poetically pulled the rug off the moment she was presented to the Filipino public. Despite the jet lag, she appeared breathtakingly stunning, as if she was ready to walk the Victoria Secret runway right at that point! Although still young at 20, Estefania has the maturity of a confident young woman, and she possesses the fierce look that is normally appreciated by the Miss Universe judges. Can you see the physical resemblance between her and last year’s runner-up Ariadna Guteirrez? Anyway, the question now is, will she be able to sustain the momentum? We will find it out in the next couple of weeks. Meanwhile at No.4 is none other than the charming and bubbly Miss Brazil, Raissa Santana! Oh Raissa! Pretty Santana! Don’t you just love to shout her name while dancing into the enigmatic rhythm of samba? Raissa is another mulatta to be crowned from a South American country with black minorities. The black population of Brazil, some 8% of them, have already mixed into the bloodline of majority of the Brazilians due to intermarriages, and one stunning beauty to come out of that mix is Raissa. Needless to say, the Miss Universe Brazil organization made some necessary internal and organizational changes just for Raissa, so watch out for the incredible evening gown and national costume that she will be showcasing to us. Raissa is the first black Miss Universe Brazil in 30 years. Completing our Top 5, and is still holding strong in our list is the sweet and sophisticated Thai delegate, Chalita Suansane. Well prepared, Chalita holds the record of the most number of luggage to be brought by a single delegate. Guess how many did she bring! According to our sources, she brought 17, which include, among others, her much anticipated national costume. Chalita arrived in Manila wearing a barong tagalog, which simply shows how her organization has carefully studied her preparation for the pageant. At No.6 is Kezia Warouw of Indonesia, who has zoomed up into her best ranking so far since the introduction of the 65th Miss Universe hot picks. The statuesque Indonesian is indeed a head turner. Standing six feet tall, her stage presence and exotic look will not go unnoticed. It also helped that she invested a lot on her training, where part of it was conducted in the Philippines. Many pageant fans, though, are not so sure about the extra tanning that she did before coming to the Philippines, but who can really tell if it will work or not! At No.7 is Cristal Silva of Mexico, who is competing in the Philippines for the second time. At Miss Earth 2013, Kristal was a Top 8 finalist, and by now we expect her to have already known the tricks of gaining the heart of the Filipino fans. A lot of us believe that Cristal is one of the best Miss Mexico winners in recent years, and this could just be the year when they will enter the Top 5 for the first time since 2010. At No.8 is Caris Tiivel of Australia. What a lot of observers have shared to us is the fact that even with minimal make up, Caris exudes such natural beauty, which is coupled with the proverbial Aussie charm, or shall we say vivacious personality. Australia has been doing quite well in Miss Universe, with four Top 5 placements and having missed the Top 10 only once since 2008. The power of the Australian sash cannot be ignored at Miss Universe. At No.9 is Keitty Drennan of Panama, who is the only delegate in our Top 10 who was “designated” to compete at Miss Universe this year. What is special about Keitty is the fact that she has waited this long to finally compete at a pageant where she truly belongs. After placing 4th Runner-up at Miss International 2011, the same year when Panama last placed at Miss Universe courtesy of Sheldry Saez, Keitty has been making a name for herself as a professional model. Last year, she was appointed by Miss Universe 2002 Justine Pasek, the new national director of Panama, to compete for the 65th Miss Universe pageant. At No. 10 is Zoey Ivory van der Koelen of the Netherlands, who happens to be the highest ranking European in our current hot picks. Zoey is indeed very pretty, and just this year, the national organization was placed in a position to choose whether to send the Miss Nederland winner to Miss World or Miss Universe. They chose the latter, and we are glad they did because we can appreciate Zoey’s beauty even more at Miss Universe stage, where the activities are more exciting and the preliminary judging being available online. Meanwhile Japan’s Sari Nakazawa (No.11) is gaining some attention, thanks to her appearance at a local news program where she spoke in flawless English. Needless to say that she will definitely get the nod from year’s major sponsor, Okada Manila, who is owned by a Japanese billionaire. Following her is the Ukrainian goddess Alena Spodynyuk (No.12) who was quite famous months before the pageant night, but is slowly losing her steam from pageant fans. However, her beauty is to die for, so we cannot scrap her out. Carolyn Carter (No.13) of the US Virgin Islands is now in our hot picks for the first time. Thanks to her live interview with Missosology, we were able to know her even better and got the chance to gauge her wonderful personality. At Miss Universe, personality is a key element to win the judges and the organizers, whose votes really matter in the selection of the Top 15. Vietnam’s Đặng Thị Lệ Hằng (No.14) is the fourth Southeast Asian in our list. This former Elite Model alumna is following the footsteps of last year’s highly hyped Pham Thi Huong who mysteriously missed the cut at Miss Universe 2015. Đặng, hopefully, will not be victimized by a poor gown choice, as we feel that she can easily win the judges’ approval with her silky white flawless skin and winsome smile. Rounding up our Top 15 is Deshauna Barber of the USA. Deshauna became as a surprise winner at the 2016 Miss USA pageant, thanks to her unique story (she is a soldier by the way) which she capitalized with her charisma and intelligence. At Miss Universe, she might need extra effort to be noticed as her story is now considered “history” and she needs to outshine the other delegates, especially the Colombian and Brazilian black barbies. Bubbling up… Sierra Leone, which is competing for the first time, is in 16th position. We are keeping an eye on this beautiful African delegate. She is followed at 17th place by Great Britain, whom many considers as the face of the pageant. The Caribbean hot babe from Barbados is in 18th spot, while Canada slid further into 19th position. Guess we expected much from her, considering that she was Miss Supranational 2015 1st Runner-up. Nicaragua is currently in our radar after seeing her raw swimsuit photos. She is now in 20th place.